So here’s a makeup palette review! As most of you may know summer of 2015 saw the launch of another new palette onto the market, Irish model Pippa O’Connor, teamed up with the company known as Blank Canvas Cosmetics and They have created a stunning eye and face palette that has really been successful throughout the beauty market. I am a huge fan of pippa and always have been. I’ve been wanting to get my hands on this palette for months and was lucky enough to be gifted it for Christmas just gone. Ever since I opened the wrapping paper I’ve been using this pallete so much. I’m just so in love with it!! The palette contains 6 matte eyeshadows, a highlighter, a blush and a bronzer. All the shades are pretty natural and not to dramatic but it’s a prefect palette that can be used for a natural daytime look or can switch things up to a stunning night time look. I feel that like many eyeshadows pigmentation of each varys from colour to colour. The lighter two colours lack a little on pigmentation side. I just find that the lighter colours take a while to build to reach the best it can be. I found that the colours Tobi, Susu, Dodo and Kd contain a little more pigmentation and were more noticable on the eye. I really love the colour Tobi in the palette as I find it works really well as a transition colour. The blusher in this palette (Pipsy) is a matte peachy pink shade. I’m not a huge fan of blusher and I don’t wear much of it as my cheeks are quite pink to begin with but I tested this out and i found it ok, giving the cheeks just a hint of colour. Onto the contour colour in the palette. Amour, really lovely. It is a the perfect colour for creating a naturally contoured look. I always try and avoid the orangey toned colours when getting a contour shade to suit and this shade little more ashy and suitable for what I’m always looking for. Finally moving onto Lulu. AMAZING!!! This is 100% my favourite part from the palette. This is an absolutely beautiful highlighter that gives your cheeks the most beautiful highlighted, natural glow. I normally find it difficult getting a highlighter to show on my skin, but this really shows up so well and you don’t need much on your brush at all. I feel that all makeup lovers need this Lulu highlighter in their lives. Now that I have it I wouldn’t be without it. 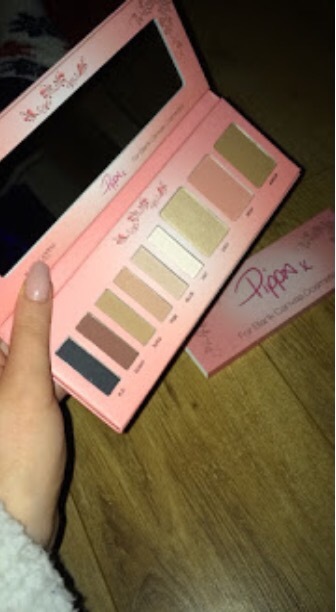 The pippa palette retails at around €34.99! Some people may find it a bit pricey but all I can say is that it is definitely worth the money. From eyeshadow, a blusher, highlighter and a contour colour it’s a must have for any makeup lovers out there. I use mine all the time and I am dreading the day it runs out. No doubt I will purchase another! Here is a look I created using all of the pippa pallete for NYE 2015! What do you guys think? Let me know your thoughts on the palette! It looks really exciting with those yellowish, chartreuse-y shades. You don’t even mention your stunning, gorgeous nails!